We have received an email response from the mayor’s office of Surrey, British Columbia regarding our campaign. We asked Surrey to take action against the dog meat trade in Seoul Dongjak, South Korea. 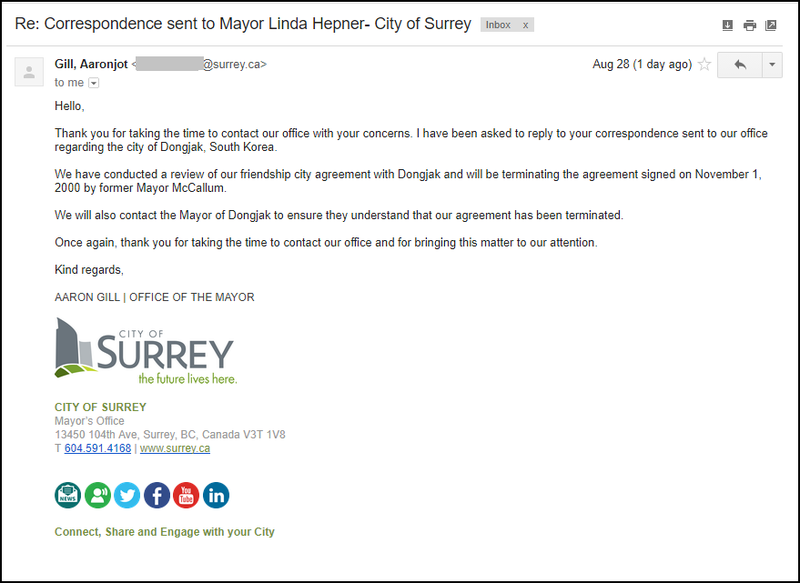 The City of Surrey has informed us that they will be terminating their Friendship City agreement with Dongjak and that they will contact the Mayor of Dongjak to ensure that they understand that this agreement has been terminated. The mayor’s office did not state the reason for termination but we assume that it is because of the illegal dog meat industry operating in Dongjak. We are grateful to the mayor’s office and the City of Surrey for responding to our concern so quickly and for taking action. At last!! A really positive response!! Very well done!! Hmmm… and when will it happen? However, thank you, Mr Aaron Gill and City of Surrey! Wonderful!But this is just very very fire step.. Thank you, city of Surrey. Thank You, City of Surrey! Brings back hope in humanity, every little bit helps! Well done Surrey! Thank you for showing some compassion. All of you other Mayors,pay attention,this is how you respond to the dog and cat meat trade!